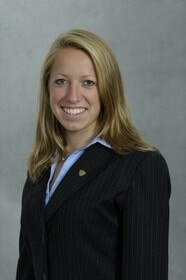 ​Laura worked at Brown & Brown Insurance for nine weeks in Mount Laurel, New Jersey. She had the opportunity to experience both the property/casualty side of the industry as well as the employee benefits side. She spent eight weeks in property and casualty working with claims adjusters updating claims on Sagitta, the online organizational system. In her time with the employee benefits division, she compared carrier renewal rates to find cost-saving options. She would then present these findings to the customer service representatives so they could show them to clients. In fact, was given a special project where she completed a renewal proposal from beginning to end, and then presented it to the client. Since Brown and Brown were in the midst of changing computer systems, Laura spent much of the remainder of her time doing clerical work and updating systems files. She felt her risk management classes prepared her very well for the policy inclusions, exclusions and endorsements she dealt with. Laura enjoyed the relaxing atmosphere of her workplace, and she learned a lot from meeting with representatives from both insurance carriers and wholesalers. The office had a large number of young people to meet and she was particularly happy to interact with two recent Temple graduates. Unfortunately, Brown and Brown didn’t have a planned internship program in place, so Laura had to blaze her own trail. Her only other regret was that so much of her work was database management and quality control, that much of her time wasn’t spent learning about insurance. However, Laura would absolutely recommend this company to other students.